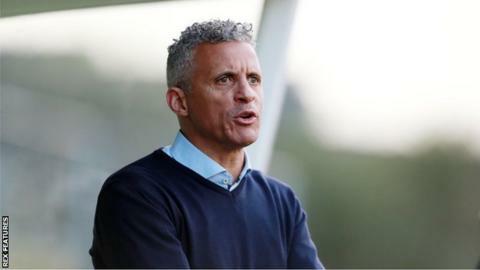 Carlisle manager Keith Curle says he is willing to speak to fans in the town about his managerial decisions. The Cumbrians slipped to their third straight defeat on Saturday, losing 2-0 at Plymouth, but are still in the League Two automatic promotion places. "Anyone in Carlisle that has got any concerns, any wishes, any desires - ring up the football club, make an appointment," said the 53-year-old. "Come and speak to me, I'm not going to hide away from it." After defeats by Argyle, Cheltenham and promotion rivals Portsmouth in their previous three games, Curle's men have fallen 11 points behind league leaders Doncaster. If fifth-placed Pompey win at Crawley on Tuesday, Carlisle will fall out of the top three for the first time since 1 October. "There's a lot of good work that's gone on at the football club," Curle, who joined in 2014, told BBC Radio Cumbria. "At the minute we are exceeding expectations. "I will not see that dismantled because a few people don't like what I'm doing, or don't understand what I'm trying to do. "If anybody has got a complaint, if anyone wants to come and have a rational conversation about why I'm doing this, and why I'm doing that... I will speak to you, I will come and meet you. "If there's a group of you, I'll come and speak to all of you. I've got nothing to hide."